Product Availability: In Stock. Orders normally ship same day if ordered by 3:30 PM Est. Package Content : 90 soft contact lenses in sterile buffered saline solution. The solution may contain up to 0.02% Polaxamer. 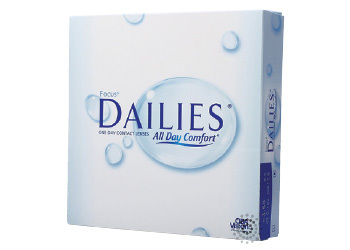 Focus® Dailies® contact lenses, manufactured by Alcon® in this 90 pack format, provide wearers with a convenient way of wearing contact lenses without concern for maintenance or messy solutions. Lenses are worn for one day and discarded; allowing wearers the comfort of fresh, clean and new contact lenses every day. Focus® Dailies® are designed with AquaRelease, as well as a time release ocular lubricant, PVA, commonly used in comfort eye drops. The AquaRelease moisturizing agent is blink-activated and is gradually released from the Focus® Dailies® lenses into the tear film. These lenses are designed for wear as a daily disposable lens that is replaced with a fresh lens every morning. Be sure to follow your eye doctor’s recommended replacement schedule. Focu®s Dailies® lenses are tinted for ease of handling, but will not change the color of your eye.